Alchemistic chakra diagram. 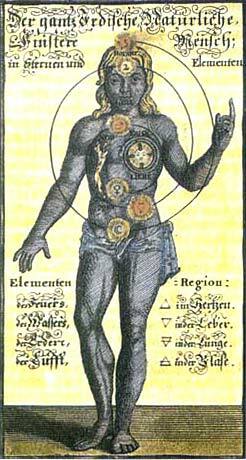 Alchemist Johann Georg Gichtel (1638-1710) from Regensburg, Bavaria here outlines the relations of resonance between the 7 planets and the 7 chakras. Alchemy, the western root of modern science, and Ayurveda, the eastern teaching for perfect health, share one common secret: The hidden knowledge about the deeper source of true health and spiritual development. It is the knowledge about the power of planets and gems and their deep effect on the human energetic system and the chakras, the main energy centres and energetic regulation system of the body. According to the ancient wisdom of both Alchemy and Ayurveda, some selected gems most effectively convey the power of the 7 planets. Therefore, for many centuries these crystals have been considered the most valuable gems and 7 planet-metals for healing purposes. Alchemy knows an elaborate and secret method to produce exceptional essences: over a period of several months, while paying attention to certain planetary constellations, the gems are being fully dissolved. "The medicine of the Maharajas" - this is how the alchemistical Gem Essences were called in former times in India. "The light of the planets" - is what the essences represented to the alchemists. 4. to support personal spiritual and intellectual development according to the three phases of transformation of the chakras (Nigredo, Albedo und Rubedo) and so for the so-called „light-body process“ or „Path to the Grail“, i.e. the accomplisment of man’s highest vibrational level in the Rubedo phase. According to the view and experience of the alchemists, the regular use of Gem Essences - for instance in the form of a "weekly treatment with the power of the planets" helps to activate the human energy system. 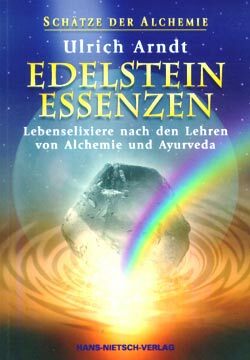 The famous German alchemist of the 20th century, Albert Richard Riedel (1911 - 1984), known as" Frater Albertus", said that "Alchemy raises the vibrational state step by step". Gem Essences essentially help to clear up energy blockages which may result from or lead to physical ailments. According to Alchemy’s traditional teachings about health and wellness, even plants possess a body, mind and spirit and each of these levels has its own healing power. From a chemical point of view, these energetic forces are associated with salts (body), oils (spirit) and alcohols (mind). So the extraction of a flower’s spiritual information by submersion in water or alcohol is just a first step in the time-consuming process of creating genuine alchemical Flower Essences. The process of obtaining, according to Paracelsus’ traditional procedures, all three levels of energetic properties for a Flower Essence takes more than three months. At least one additional month – from one full moon to the next – is necessary for maturing the essence in closed containers and letting it absorb the light energies of sun and moon. And during the whole production process, from picking the flowers until final maturation, planet positions are taken into account, especially the position of the specific planet the flower is associated with. All this results in an extraordinary flower elixir with a widespread and comprehensive effectiveness. In Alchemy, „rubedo“ is the term for the highest vibrational level of human beings and substances. All things and beings possess an inherent potentiality to evolve „towards the light“, „towards rubedo“, even when temporarily entangled in utter „darkness“, in sickness, suffering and mindlessness, in other words, the lowest vibration called „nigredo“, „blackness“. It is the purpose of alchemy to foster the natural development towards a higher vibration, towards order, harmony, love, sensitivity and awareness. Consequentially, „Rubedo“ is the name of a series of extraordinary elixirs, created by the German alchemist Achim Stockhardt in faithful adherence to the ancient principles of the Alchemist’s craft, containing the highest vibration of a metal, jewel or plant.